Watch: Who wants to see some Kylian flair? 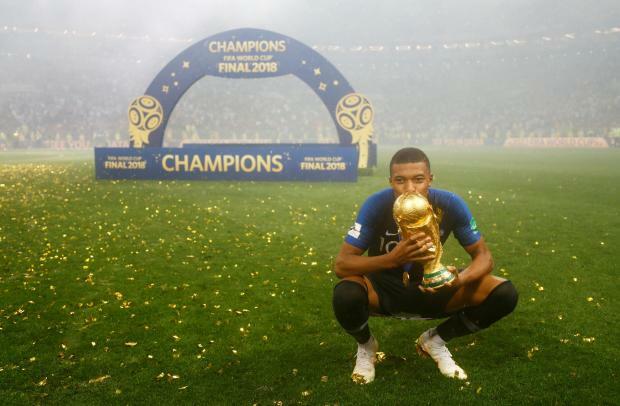 France's Kylian Mbappe celebrates with the trophy after winning the World Cup. Kylian Mbappe has been one of stars of the World Cup, with four goals for France helping him land the young player of the tournament award. Here, Press Association Sport looks at some of the 19-year-old's most memorable moments in Russia. Mbappe became France's youngest scorer in a major tournament when he tapped home to settle a compelling group game against Peru and secure France's place in the last 16. The youngster has been tipped for big things for some time now and this marked his arrival on the grandest stage. The youngster proved the difference by scoring a brilliant second-half double as France beat Argentina 4-3 in a last-16 thriller. Before getting on the scoresheet himself though, Mbappe earned the penalty that saw France go 1-0 up with a blistering burst of pace. He picked up the ball deep inside his own half and charged all the way upfield before being bundled over by Marcos Rojo. With the score in Kazan locked at 2-2, Mbappe swung the game in France's favour when he gathered the ball in a crowded area, pushed it wide and then fired home with a low, left-foot shot. Moments later he was at it again, racing on to a through-ball from Olivier Giroud to round off a rapid counter-attack with another clinical low finish, stroking home from just inside the area. Mbappe may not have scored in the semi-final victory over Belgium but he still caught the eye, most notably when he created a chance with a brilliant piece of skill. The Paris St Germain star had his back to goal when the ball came to him but he had the control and awareness to play in Giroud with a superb flick behind. A memorable World Cup for Mbappe was capped shortly after the 4-2 final defeat of Croatia in Moscow when the 19-year-old was named FIFA's young player of the tournament.